First, I did a poll directed to those mothers who ended up with emergency c-sections to see how many of them received drugs to induce. You can find the results here. “If your birth ended in an emergency c-section, were you given any drugs to start labour or speed up labour prior to the need for a c-section?” Results: 68% Yes to 32% No. Second, I did a poll directed to those mothers who received any drugs to start or speed up labour and asked what was their mode/method of delivery. If you received any drugs to start or speed up labour, what method of delivery did you birth your baby? Results: 74% vaginal, 26% emergency c-section. Lastly, I did a poll for mothers who DID NOT receive any drugs to start or speed up labour to see what their mode/method of delivery was. If you did not receive any drugs to start or speed up labour, what was your birth delivery method? Results: 92% vaginal, 8% c-section. What does all this mean? Does it mean that induction doesn’t actually REDUCE C-section risk, but instead it seems to INCREASE the risk of C-section? It definitely looks that way. 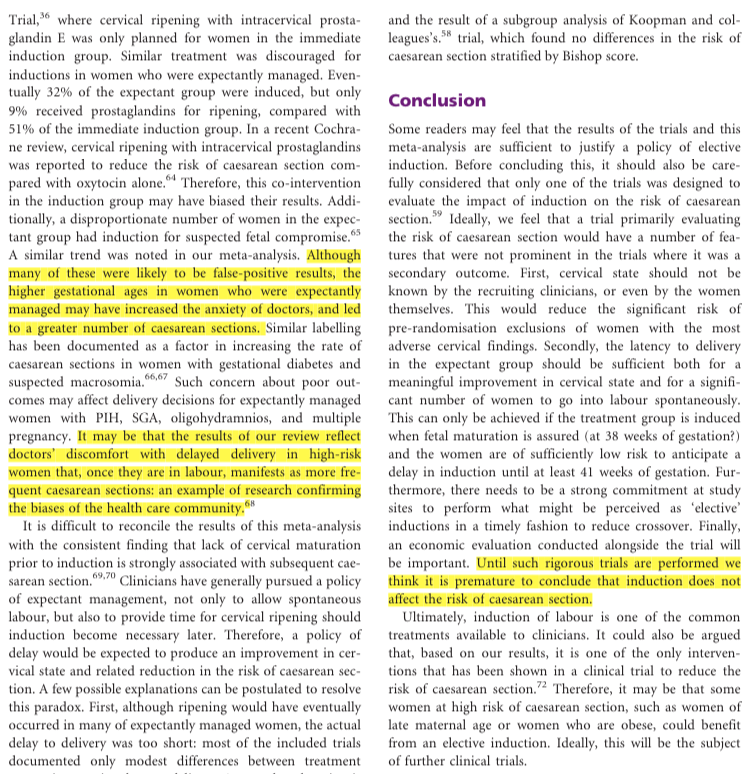 So I decided to go back to that study and try to understand how it could come out to say, “Overall, the risk of cesarean delivery was 12% lower with labour induction than with expectant management,” (CMAJ, 2014). 1. The authors did not do any actual testing. This article is based on a collection of 157 RCTs (random controlled trials). They waded through 2,894 potentially relevant studies, tossed out 2,679 of them. They actually reviewed 215 RCTs and then tossed out another 58 RCTs to come to the final 157 RCTs with records of 31,085 mothers with singleton pregnancies. 2. The authors CHOSE which studies to include. Note that from the 2,894 RCTs, they ended up using numbers and data from only 157. In fact, they even stated that they excluded 11 RCTs where “the control group included women in spontaneous labour.” There should be no reason to throw out these 11 RCTs. What are they comparing? See, in my polls, I wanted to see the difference between spontaneous labour mothers and induced mothers to see their delivery method. Without having numbers of women who went into spontaneous labour, how can you find out if induction reduces or increases c-section risk? There’s no problem with having women in spontaneous labour be in the control group, unless you want to show that the control group already has a high c-section risk. 3. 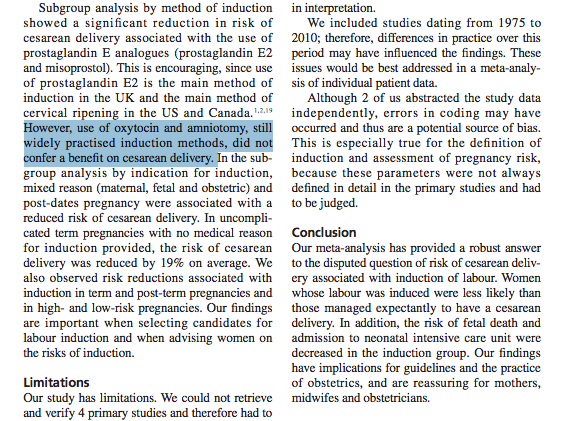 The authors considered ALL INDUCTION METHODS (including natural methods) as induction. 4. The results showed that only CERTAIN KINDS (not Oxytocin or Syntocinon) of ‘induction’ reduced c-sections. These 4 methods were Prostaglandin E2, Misoprostol, Alternative Method, and Mixed Method. The figure below is taken from this study. NOTICE that Oxytocin, Isosorbide mononitrate, amniotomy and oxytocin, mechanical, induction of uterine contractions, and preterm inductions had the HIGHEST relative risk percentages, and these are the most common methods of Induction that are used on mothers today. Let me say this again. There was NO significant decrease of risk of c-section for the following methods of induction: Oxytocin (uterine contractions), Isosorbide mononitrate (cervical ripening), amniotomy (breaking bag of waters) and oxytocin, mechanical, induction of uterine contractions, and preterm inductions. Note the highlighted portion about Amniotomy and Oxytocin! 5. What are the authors comparing? What is the relative c-section risk percentage relative to? I wonder what and how they are comparing induction versus not induction mothers and c-section rates. 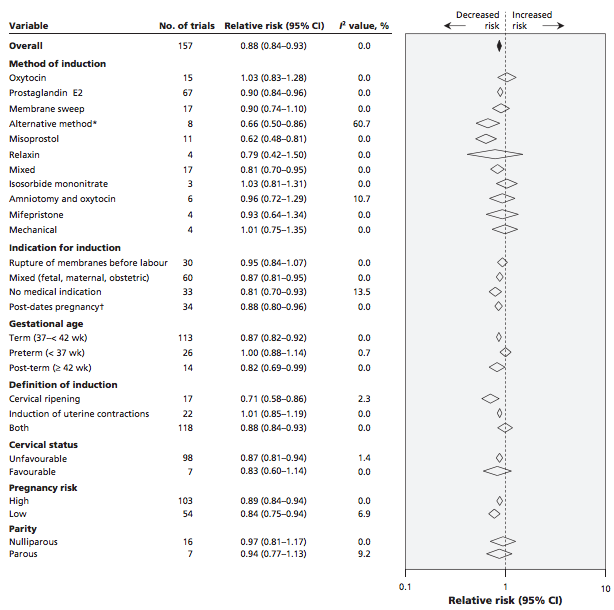 It is not explained in this study what the risk of c-section is for mothers who did not receive any form of induction. I would love to see at least one figure showing c-section rate for these mothers. The best way to reduce your risk of c-sections is through knowledge! Sign up for a Bradley Class today! < Results from Last Week’s Poll: If you did NOT receive drugs to induce, what was the delivery method?